33 lions, rescued from appalling conditions in circuses in Peru and Colombia by Animal Defenders International (ADI), surely cannot believe their eyes as they roared in their first sunrise in the African bush. A record-breaking cargo flight with all 33 lions on board jetted into Johannesburg on April 30th, 2016. The lions, saved during an ADI mission to help enforce bans on wild animal acts in Peru and Colombia, are now settling into their forever home at Emoya Big Cat Sanctuary, situated on a private estate in Limpopo Province. Many of the lions have been declawed and have broken teeth so would not survive in the wild. A massive ADI relocation effort began on the Thursday morning in Bucaramanga in Colombia, with nine lions loaded into travel crates and travelling to Bogota by truck. The same night 24 rescued lions were loaded into travel crates in Peru and taken to Lima Airport. A huge MD11 aircraft chartered from ethical cargo company Priority Worldwide Services then flew the nine lions from Bogota to Lima where they were joined on board for a trans-Atlantic flight to Johannesburg – not without its problems due to a long delay in Brazil due to a computer problem. The lions were monitored throughout the flight by ADI President Jan Creamer, ADI Vice President Tim Phillips, and ADI veterinarian Eva Chomba. The lions arrived in South Africa on the Saturday evening, bellowing out a huge roar that echoed through the aircraft as they touched down. Trucks donated by Ibubesi Transport Logistics then carried the lions to Emoya Big Cat Sanctuary in Limpopo, arriving Sunday morning. The dawn of a new day marked their first full day of freedom under the African sun and new beginnings for the lions in the natural bush environment they now call home. Returning to the homeland their ancestors had been torn from, the lions can feel the African soil beneath their feet and the sun on their backs, protected within an environment they can be given the care they need. 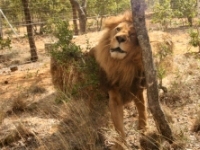 One of the nine lions from Colombia, Iron, was the first of the 33 to step into his forever home, clearly relishing being able to rub up against a tree, another first for the big cats who had formerly lived in cages on the back of circus trucks. To familiarize the big cats with their new home, the lions will initially live in “bonding camps” where families will also be reintroduced. Then, over the coming months, the lions will be released into huge habitats with platforms and watering holes, for which donations are being sought as well as the lions’ ongoing care. ADI has launched an appeal to fund phase two of the lion habitats and to care for the lions for life, which for some lions could be as long as 20 years. Please make a donation today.